Kingman turns the Irish 2000 Guineas into a procession. Shifting Power second. James Doyle has every reason to have that cheeky smile on his face after passing post to land his first ever Classic aboard Kingman! Beaten into second in the Newmarket equivalent earlier this month, his backers never really had an anxious moment on this occasion as he travelled powerfully throughout. The John Gosden-trained colt moved smoothly into contention and the response was immediate when Doyle pressed the button a furlong out. The 4-5 favourite dispelled any fears over the testing ground as he went five lengths clear of the supplemented Shifting Power. Mustajeeb finished third. 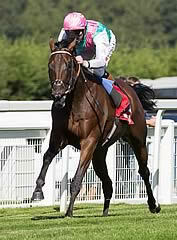 Gosden said: " Two (furlongs) out, you could see he was cruising. He's a very talented horse and it's lovely to win a Guineas with him." The Newmarket handler had walked the course before giving Kingman the all-clear. Asked how close he had come to taking the son of Invincible Spirit out, he said: "I was quite close, I walked the whole track and it was very debatable. The groundsman has done a fantastic job. "If they'd had a big handicap over that ground first I probably wouldn't have run, they stayed just off the rail where they had raced in the sprint. It's good track management and important when trying to run a Classic. "He's won on good to firm, good to soft and now soft to heavy, so he's covered all dimensions. "Drawn number one in a normal race you'd be concerned about getting boxed in, so when they came across it left him with a clear run and able to relax and come when he wanted. "I was talking to Frankie (Dettori) and James this morning and I told him to sit chilly and wait and wait. A mile was taking some getting in the conditions - he rode him beautifully." He added: "He's a miler and it's good fun because of Richard Hannon (trainer of Newmarket Guineas winner Night Of Thunder), who I'm very fond of. We've got some rivalry now as the score is 1-1. He'll go for the St James's Palace (Royal Ascot) now." Teddy Grimthorpe, raicng manager for Kingman's owner Khalid Abdullah, said: "He travelled really well in the race and did it pretty comfortably. You want good horses to have a bit of spirit. "Prince Khalid said we have to make this horse a Classic winner. This is a hugely important race for us. I would think we would be still thinking about the QEII (Ascot) at the end of the year, but we've a few little obstacles to get past before then."